Quitting smoking isn’t an easy task, but by educating yourself about how to handle the process of smoking cessation, it becomes easier. The symptoms of smoking cessation lasts for 2 weeks or more for some people, but it’s a temporary phase. Your life after that phase would be very healthy. 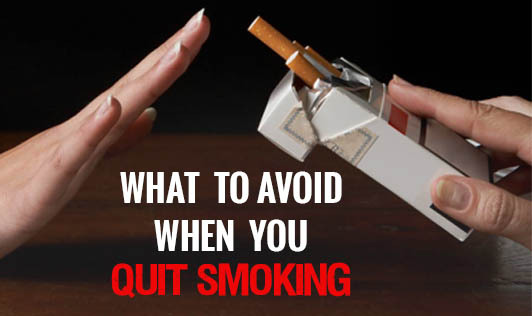 Let’s see what things one should avoid when quitting smoking. 1. Impatience: Smoking cessation is a process, not just a task which will be complete when you decide to quit. It becomes a little difficult to let go of any habit which was a part of your lifestyle earlier. But with patience and endurance, you can overcome that uncomfortable feeling which lasts for a few days. 2. Negativity: Your negativity ends when you decide to quit smoking and choose a healthy lifestyle. So don’t think about the years which you have spent smoking. Think about the healthier life which awaits you. 3. Shying away from asking for help: If you need some help from the family members and/or friends, do not hesitate. Spend quality time with them and distract yourself from the nicotine withdrawal symptoms. 4. Ignoring yourself: Your body needs extra care as you move through the early phase of smoking cessation. A balanced diet, plenty of water intake, good exercise regimen and sufficient rest, these are the factors to be taken care of. All these things will help you to be comfortable and reduce all the irritability caused during smoking cessation. 5. Letting the stress in: We talked about taking care of the body, but the mind needs extra care too. When you quit smoking, it creates its own stress and tension. You need to be careful about not giving up to these emotions. Take some time out for relaxing and rejuvenating, as it will help you to freshen up and hold on to your goal of eliminating the cigarettes from your life. 6. Drinking alcohol: Remember alcohol intake and smoking go hand-in-hand. A smoker tends to have an urge to smoke with the alcohol consumption. Avoid drinking alcoholic beverages to stay away from that urge as far as possible. Go for fresh fruit juices or milkshakes or coconut water instead. 7. Going for “just one more”: There is no such thing as “just one” or “once in a while”. Either you smoke or you don’t. Don’t fall for the urge to smoke just one cigarette. It can pull you back in the smoking zone again! 8. Not having a reason to quit: Whenever you decide to quit smoking, make sure you have a reason for it. That reason can hold you back every time you think about going for that “just one cigarette”.